Our September 15, 2018 Hilo event was held at The Home Depot. Despite periodic rain, we had a good turnout of club members and the general public. Members drove from Kona and Kau (West and South Hawaii) to join our event. One member drove 80 miles with his 1980’s Mercury Lynx EV conversion. We had a good selection of electric cars – Tesla Model 3, Model X, and Model S, Chevy Bolt and Volt, Kia Soul, Nissan LEAF, BMW i3, Mitsubishi i-MiEV, Mercury Lynx, and the BYD SUV, a total of 23 electric cars. Kamaaina Nissan and De Luz Chevy brought the 2018 Nissan LEAFs and Chevy Bolts, respectively, and conducted several test drives. Citizens’ Climate Lobby representatives shared information about the Revenue Neutral Carbon Fee and Dividend concept. Our local utility (Hawaii Electric Co.) addressed questions regarding their Fast Charging infrastructure and TOU program. They also brought along their BYD (Chinese) electric SUV. Senator Russell Ruderman gave a speech about the importance of the electric car and shared his personal experience with his 2018 Nissan LEAF. Heather Kimball, former Sierra Club chair, scientist, business owner, and local environmental leader, gave a speech about her experience (she also owns a Nissan LEAF) and the importance of sustainable transportation. Barett Otani, the County Deputy Director presented the association with a letter of appreciation from the Mayor’s office. We had good traffic throughout the event. (It helps that our residents are not fazed by rain. Hilo is one of the wettest towns in the nation.) Many guests were interested in getting an electric car. Several were already EV owners who wanted to join our association. 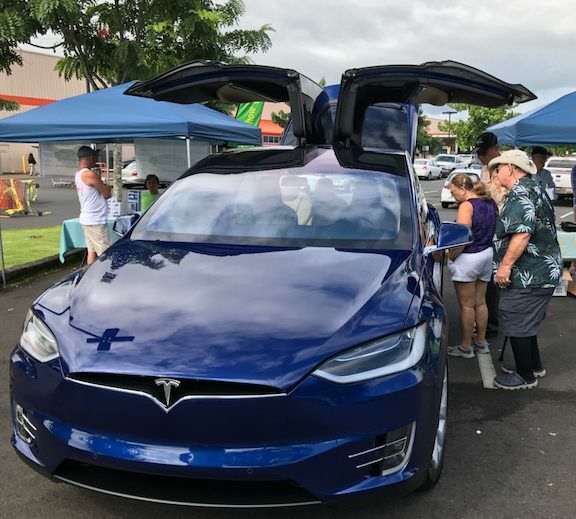 Thank you to the National Drive Electric Week organizers, The Home Depot (including Fati Yamasaki, store manager, and her staff), Ulupono Initiative, Heather Kimball, Russell Ruderman, Barett Otani, Citizens’ Climate Lobby, and BIEVA volunteers for making our event possible. Event participants during a speech by Senator Russell Ruderman. Several EVs are in the background. Representatives from HELCO will be participating. They will be available to address questions regarding their Fast Chargers and Time of Use rates. The Citizens' Climate Lobby will also be in attendance. They will be sharing information about another innovative approach to help to solve our climate challenge. We expect to have representatives from Kamaaina Nissan, DeLuz Chevy, and Aloha Kia in attendance. They will share information about their latest electric cars. Tesla will not be able to join but we'll have several owners and experts on hand to address your questions about purchase and ownership experiences. Registered attendees report 337,365 electric miles driven.